The ASM Safe Boating Training and Boat License Course. 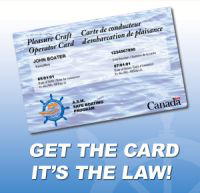 If you operate a powered watercraft in Canada, it is Canadian law to carry the Pleasure Craft Operator Card*. ASM Safe Boating encourages all boaters in all provinces to take a Transport Canada approved course to obtain the boat license. How easy is it? Take the 3 hour boat safety and licensing course online, complete the 75 minute online TC exam, that’s it. Heading out to the cottage? You can also attend a classroom boater course in your area. Get the card and get boating! Since 2010, all Canadians are required to hold a valid Pleasure Craft Operator Card (PCOC) in all provinces across Canada. This boat license card is issued by Transport Canada and is valid in Ontario as well as all other provinces. There is no special license required for boating in Ontario, so as long as you hold your valid PCOC you can enjoy the beautiful waterways of Ontario with extra safety and peace of mind. Who needs a boating license in B.C.? If you operate a powered watercraft in the province of British Columbia, then you need to carry a valid Pleasure Craft Operator Card. Sometimes referred to as a boating license, the Pleasure Craft Operator Card (PCOC) is actually a federal certificate issued by Transport Canada and valid in all Canadian provinces and territories. You can obtain your PCOC by completing the Transport Canada-approved online course. Classroom courses are approximately 3 hours long and include the final Boater Exam. A temporary license is issued on site and the permanent card is mailed in 2-3 weeks. Get your Pleasure Craft Operator Card ONLINE through our partnership with BoaterExam.com®! Print a temporary card when you pass and your permanent card is mailed in 2-3 weeks. Take the Online Boating Exam Now! Buckle Up! Five Coolest Amphibious Cars. Picture this: you're in a car careening off a fifty foot bridge, gripping the steering wheel and screeming like the Incredible Hulk having a seizure. But then you remember one very important fact: your vehicle is in fact AMPHIBIOUS! ASM Safe Boating's database of cards is now part of BoaterExam.com®'s National Central Databank. BoaterExam.com® is the largest issuer of Pleasure Craft Operator Cards in the country and the leader in security, customer service, and customer privacy. Boater Exam® is also a proud sustaining member of the Ontario Federation of Anglers and Hunters. BOATER EXAM® is a registered trademark owned by Skipper Online Services (SOS) Inc. and is being used under license.